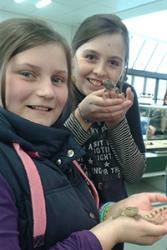 Holding leopard geckos at part of last year’s event are Robin Scanlan (left) and Megan Elias.‘Hidden worlds’ the flagship event at Bangor University’s Science Festival, which runs 13-22 March 2015, is offering even more hands on activities and demonstrations in this the Festival’s fifth year. ‘Hidden worlds’ takes place in the Brambell Building on Deiniol Road between 10.00- 4.00on Saturday 14th March and is free and open to all. The laboratories will be teaming with activities such as ‘Predator and Prey’ and Photonics ‘the science of light’, as part of the hands-on science day. The usually private research aquariums will be open and visitors will also be able to hold and touch reptiles and sea creatures; the general public will also be given access the to the University’s impressive natural history museum. Added to this, the Popular ‘Flash Bang’ Chemistry shows take place at 12.00 and 1.30, guaranteeing plenty to do and see for people of all ages at the event. Other public events during science week include guided geological walks around some of our spectacular landscape. These are on 15th and 22nd March, and joining instructions are on the Festival website: http://www.bangor.ac.uk/bangorsciencefestival and a 125th anniversary lecture from the School of Electronic Engineering. 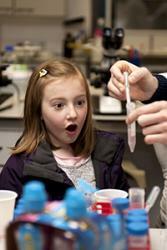 A would-be scientist is impressed with DNA extraction.A Sustainable Resources Careers Event is also part of the Festival. The event, running between 1.00-5.00 Wednesday March 18th at the School of Ocean Sciences, Menai Bridge will introduce people to the types of jobs which are becoming available in the emerging Sustainable Resources sector, and skills required to do those jobs. This event will illustrate the employment and training opportunities in the Sustainable Resources sector here in north Wales as well as firing people’s enthusiasm for the new opportunities emerging. Full details of all the events are available on the Events website.